Email setup is becoming more complicated as there are more devices (Apple, Android, Desk Top and Laptop, Mobile Phones and more!) and there are many ways of configuring your emails to suit your needs. ALSO - it is important to set your email up correclty to ensure it is safe! - Any tiny little error will stop your email from working, ensure you have used correct spelling. - Make sure you only use capitals where they are specified. Please make sure you refer to the PDF Instructions you are given (You should have these saved and printed for reference). login to the Control Panel (Cpanel) Use the web address and usrname/password at the bottom of the PDF page. Click on the emails button. Beside the appropriate email, click on the more button, and then click on configure email client. This page will have options to auto configure your email - just click on the option that you are using (eg. outlook, mac mail etc.) and the auto setup will complete your email settings - EASY AS! PLEASE NOTE: Make sure your internet connection is working!!! 1. Generally, Your emails will be working if your website is able to load! The best way to test this is to login to your webmail (www.yourdomain.com.au/webmail or www.webmail.yourdomain.com.au) then follow the instructions to view all your email that is stored on the server. Please note: If you have just run outlook or another email program - these may download your emails from the server in which case there will be no emails - so please send test emails to check properly. 2. If you can login and emails can be seen - but you can not receive any more emails, this will be because your inbox or email quota is full, or your entire website hosting allowance is full. To fix this, there are 2 options, please do some house cleaning and delete all old emails - this will free space. 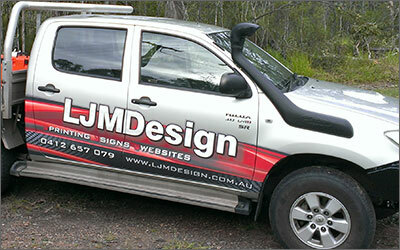 The other option is to call and order a larger hosting space through LJMDesign, but remember this will eventually become full as well unless you maintain your emails!!! 3. 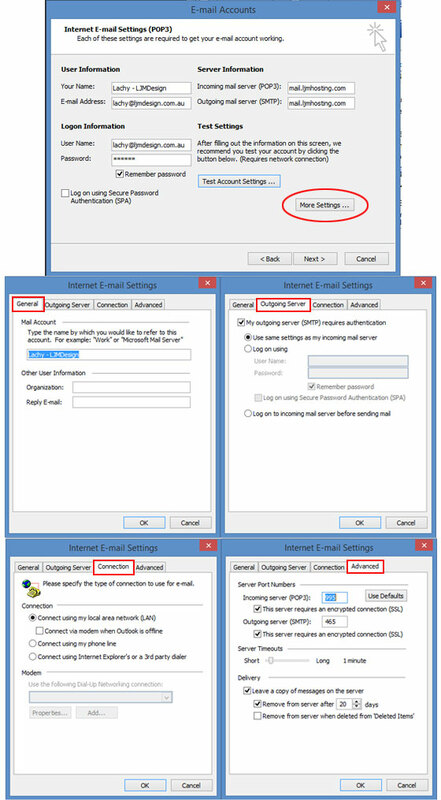 You can not send emails, please update the email setup details to the latest configuration, and this will allow you to send anywhere, on any Iinternet Service Provider.